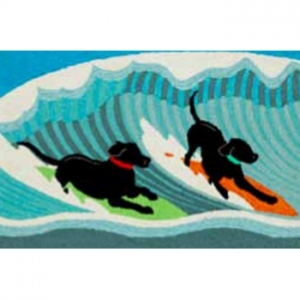 Select Size 20"x30" 24"x36" 30"x48"
Surfing Dogs Ocean Indoor Outdoor Doormat features surfing dogs on green and orange surfboards. Yes, you do see dogs surfing the waves! This unusual and fun design with blue wave ocean background is a best seller! The content and quality of this hand tufted, synthetic blend coastal rug will hold up to indoor or outdoor use. Richly blended colors add vitality and sophistication to playful novelty designs. Lightweight loosely tufted Indoor Outdoor rugs made of synthetic materials and UV stabilized to resist fading. These whimsical beach themed rugs are sure to liven up any indoor or outdoor space, and their easy care and durability make them ideal for kitchens, bathrooms, and porches. We are very pleased with our rug. The colors are bright and vibrant. We will order again. Disadvantages: Not suitable for outdoor use. Love this rug! It was the perfect size and the colors are very high quality! The surfing dogs on it are super cute!